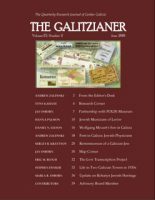 Published since 1993, the Galitzianer is the quarterly research journal of Gesher Galicia. The journal is published in March, June, September, and December. 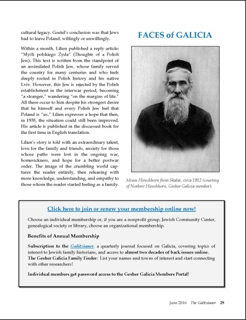 Members of Gesher Galicia can opt to receive their subscription to the Galitzianer in either digital or paper format. 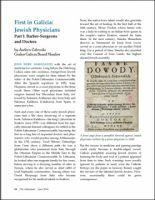 Past issues of the journal are also searchable and available for download in Gesher Galicia Members Portal. 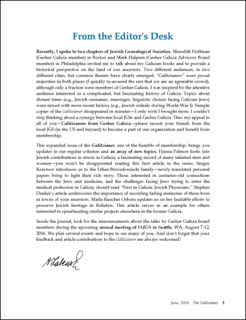 The Galitzianer encourages submissions by the members of Gesher Galicia. Please consult our submissions policy and instructions for authors for details. 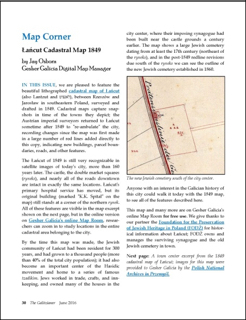 The journal also serves the membership by publishing a broad array of articles contributed by non-members from other genealogical organizations, researchers with diverse expertise, academic institutions, and organizations broadly involved in the mission to preserve Jewish heritage in the former Galicia. 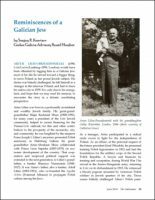 Another regular section is “Faces of Galicia,” which includes photographs and/or drawings submitted by readers and linked to the past Jewish presence in Galicia. 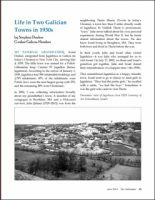 Throughout the year, the Galitzianer also introduces its readers to contributions by the Board of Directors and the external experts from the Gesher Galicia Advisory Board. The Galitzianer accepts written material broadly linked to Galicia (1772-1918), which may also include topics pertaining to earlier (before 1772) or later periods (post 1918). 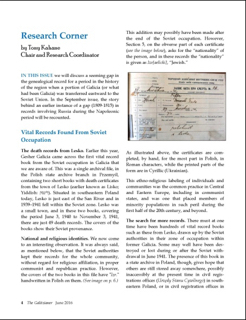 The thematic scope of interest covers family stories, information about unique archival records, tutorials regarding genealogy research, history and geography of Galicia, book reviews, etc. The editorial committee reserves the right to revise or reject a submission, or to defer publication until a later date. Submission of a non-commissioned manuscript does not guarantee its publication. Prospective authors are encouraged to contact the editor to consult about an interest in a potential topic for a future article. Please direct your queries or suggestions to: submissions@geshergalicia.org. full length articles (up to 2,500 words). They should be written in English (the journal follows the Chicago Manual of Style, 17th edition). The proposed text (Microsoft Word file) should be attached to the email addressed to the editor. Articles requiring major revisions, unfinished work or not submitted in Microsoft Word format will not be considered. Unless commissioned by the journal, multipart articles are discouraged. Note to the authors: do not place illustrations in the Word document of your submission. Instead, the journal requires submission of numerically labeled illustrations as separate attachments (jpg format; at least 300 dpi; Fig. 1, Fig, 2, etc.). The author should indicate in the text an approximate placement of submitted illustrations (e.g., state “insert Fig. 1”) and provide clearly labeled short captions at the end of the submitted article (e.g. Fig. 1. The text of the caption, Fig. 2. The text of the caption, etc.). The authors are responsible for securing permission to reproduce any material. If the article was published elsewhere, the author should include the name of the journal/book, date of publication, and the permission for re-publication in the Galitzianer. In case of acceptance, the authors agree to transfer the copyright of their publication to Gesher Galicia. The journal does not offer payments for any type of submission. Submit the articles via email (submissions@geshergalicia.org).